Spend Less. Save More. Live to the Fullest. Get updates sent right to your inbox! Today, I want to share with you how we keep our kids off electronic devices. Electronic devices are becoming more and more popular these days. They’re convenient and keep us in touch with family and friends. It’s easy to find ourselves spending a lot of time on electronics. This can be good and bad. As adults, we should be able to manage the amount of time we spend on our electronics. We shouldn’t expect the same thing from our kids. Kids need to learn how to manage their time on electronic devices. This is something we need to take the time to teach them. We were having a hard time keeping our kids off electronic devices. It was more of managing the time they spent on electronics each day. I had no way to track it. One of my sweet friends shared with me how she keeps her kids off electronic devices so we decided to give it a try. Her method works great and we have been successfully using it for about a year now. We call it the “ticket system”. If you’re serious about keeping your kids off electronic devices than you should give this a try. It does require parent involvement but doesn’t everything when we’re trying to teach our kids? This “ticket system” allows your kids to be on electronic devices as much as you allow. We set our system up to allow our kids to be on electronics for 1 hour a day. They can choose to use their tickets all in one day or spread it out throughout the week. There are also opportunities for them to earn extra time for electronics. Figure out how much time you want to allow your child to be on electronics each day. We decided to make each ticket worth 30 mins. Based on that, we give our kids 14 tickets per week. Each Sunday starts a new week. If they have tickets left over from the previous week, we allow them to keep them. Think about the rules you want to put in place. One of our biggest struggles with our kids is laziness. 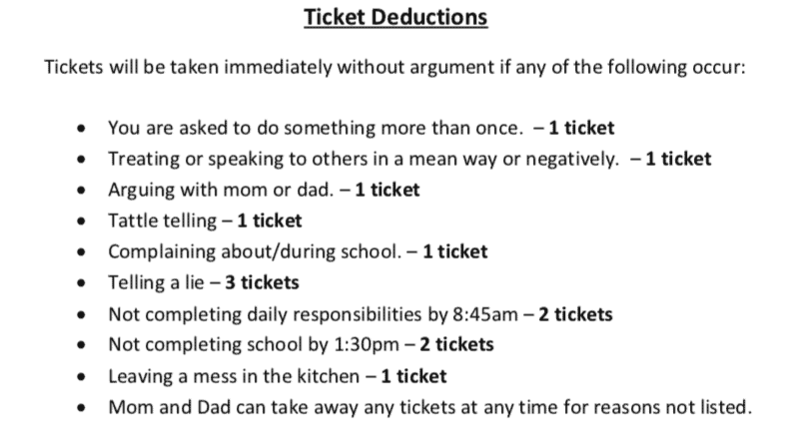 We made a rule that they can’t redeem tickets until all their daily responsibilities and school is complete. This gives them the ambition to get up and get their stuff done. Check out our rules in the picture below. Give an incentive. We decided that if our kids have good behavior, they can earn extra tickets. The amount of tickets they earn is up to us. We may reward 1 extra ticket or 5 extra tickets. It depends on what it is. Think about ticket deductions. We take tickets for multiple things. Check out our deduction items in the picture below. Think about ticket redemption. We listed each item that they can redeem tickets for. 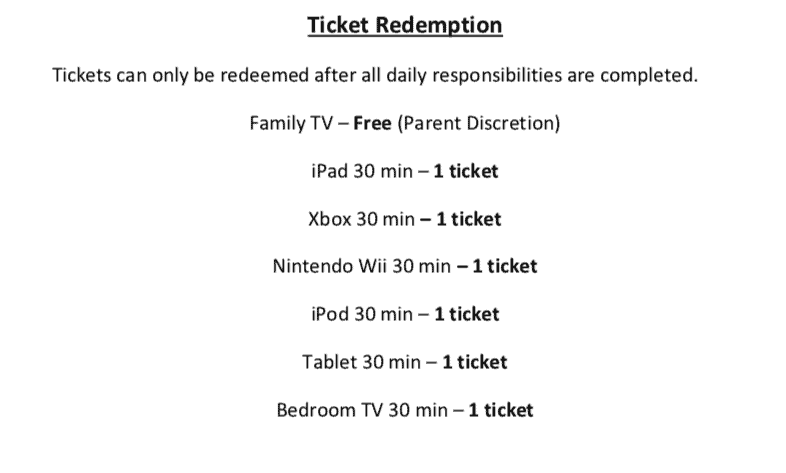 Check out our ticket redemption items in the picture below. Put it all together. We decided to write out our ticket system for two reasons. First, so we could remember the rules and second, so the kids could remember. That’s our ticket system. If you want to use the system exactly as we do, then click this Ticket System link to download a copy. We printed tickets right off the internet. You can even buy them somewhere. We made sure to put each kids name on the tickets so we know who they belong to. This keeps them from trying to take each other’s tickets. It is our job as parents to keep kids off electronic devices. We need to remind them that life isn’t all about electronics. They still need to learn how to use their imaginations and creativity skills. How do you manage electronics in your house? This is seriously a genius idea! I should start using this right away with my son – he always seems to take advantage! Yeah! I feel like they know how to “work me” so this is the one thing that has worked for me so far. This is a great idea! My boys have to complete chores to get 30 minutes on the computer. That’s great! However it works for you! What a great idea! Love this- will definitely have to try to implement at home. Thanks! This has really helped us keep track of the amount of time they are spending on their electronics. This is such a great plan! And I find that it’s always easier to parent when the expectations are laid out clearly and everyone understands them. It is sad to me how many parents feel that they can’t control how much time their kids spend on devices – as you said, it’s our job, and if we can’t help teach and set limits, who can? Thanks for the great info! We tried everything. The blended family aspect made it tough. Our kids are adults and still make fun of us but I bet when they have kids they will be even stricter. What a great idea. I do something similar – they have a summer schedule of various tasks from education to outside play to chores and once they’ve completed that, they can have 1 hour of ipad. I’m Apryl and I'm the author of Money Wise Steward. 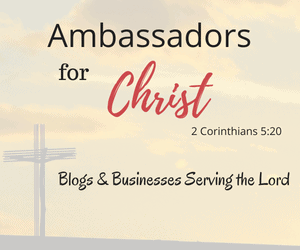 I'm a Jesus lover and He has given me a love for helping others manage their money. I love sharing everything faith and finance. You can learn more about me and my mission on my about me page. Have a Blessed Day! The Best Way to Get Rid of Cable | How We Save Over $800 a Year!